If you are surprised or even shocked by this extremely low rating, you should know that this review has been written by the other half of DisAgreement who until now always made a huge detour around the crazy Finns, could couldn’t take it anymore this time. It’s not as if I don’t like their music, but it needs a few ingredients that are sorely missing this time. 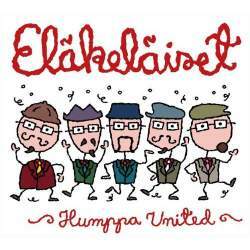 First of all, Eläkeläiset are always best in a live setting where there two-beat polka develops its ultimate charm. Their drunk performances are legendary, without a doubt. Even their early studio albums were funny. Us Indo-European speaking people never got the verbal joke, but at least we could play spot-the-tune, which was hilarious considering their irreverent takes on well known classics. Once you start listening to their already fifteenth longplayer Humppa United, you will instantly recognise the opener, a scandalous revamping of Kill The Poor by the Dead Kennedys. In poor taste, I guess, but isn’t that what this band is about. From there on, it unfortunately only goes downhill. There is nothing wrong by covering bands like Turbonegro, Hanoi Rocks, The Damned or Pixies, but when you choose obscure tracks that hardly anybody knows, there is no fun left. Wooly Bully by Sam The Sham & The Pharaos is one of those outsider tracks that everybody has heard already somewhere, and towards the end of the CD, there is a weird rendition of XTC’s Making Plans For Nigel. Some songs even have some charm (Tom Robinson’s Sing If You’re Glad To Be Gay), but all in all, this is not enough. If you lack the music-historical background and don’t understand the Finnish language, there is no joy to get out of listening to this album. Standing on its own, it could still be ok, but compared to their earlier, much better albums (where they destroyed more popular hits), I can’t really recommend Humppa United.